Double your family's dining pleasure by serving two favourites simultaneously. These burgers include all kinds of tasty nacho toppings. Mix ground beef and chorizo just until blended; shape into 4 (1/2-inch-thick) patties. Grill 5 to 6 min. on each side or until done (160°F); top with Kraft Singles. Add buns, cut sides down, to barbecue. Grill 1 min. or until Singles are melted and buns are lightly toasted. 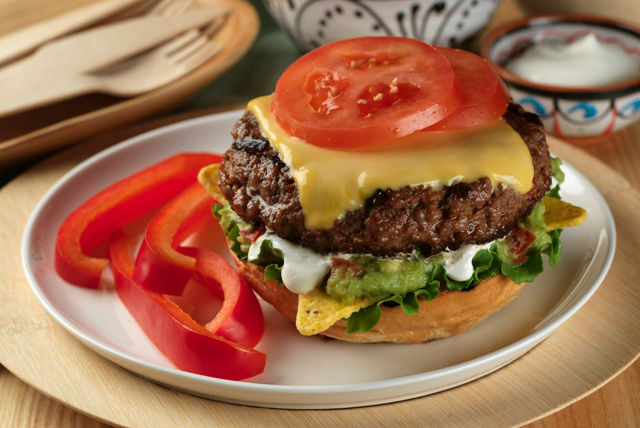 Place lettuce on bottom halves of buns; top with chips, guacamole, sour cream, cheeseburgers and tomatoes. Cover with tops of buns. Serve with a mixed green salad tossed with Kraft Italian Zesty Lime Dressing to round out the meal. Cook patties in large skillet on medium heat 5 to 6 min. on each side or until done (160°F). Top with Kraft Singles; cook 1 min. or until melted. Meanwhile, toast buns under the broiler, if desired. Fill buns with cheeseburgers and remaining ingredients as directed.